The school, located about 20 miles east of Allentown, offers dozens of athletic program opportunities to its student body of more than 1,500 in grades 9 through 12. Rob Zemanick, the school’s Director of Facilities and Operations, raised the idea of installing a digital scoreboard at the school’s football field, which also hosts soccer, lacrosse and field hockey games, as well as youth camps, marching band competitions, and other community events. “The idea was to give the school a way to raise revenue and enhance fan engagement, while also providing a learning experience for non-athlete students interested in television and video production,” Zemanick said. Working with FastSigns of Easton, Pa., the original plan was to install a “mini jumbotron” next to its existing football scoreboard, but once everyone understood the versatility of the video board, the decision was made to install a large virtual scoreboard that could be used for multiple sports. 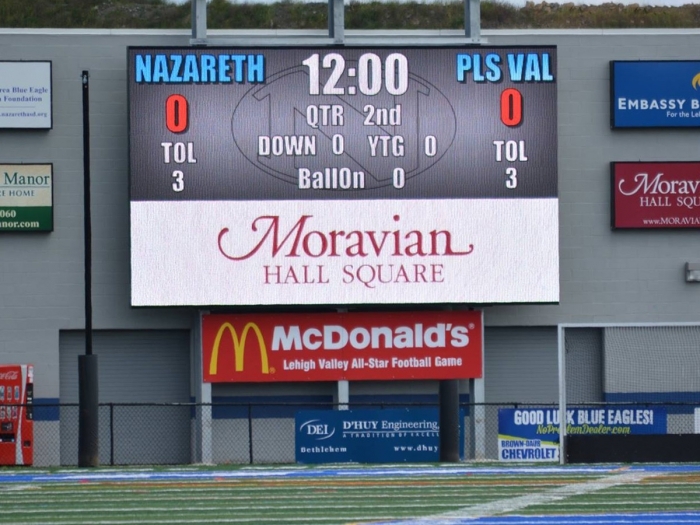 Nazareth Area High School selected Watchfire Signs to manufacture the football stadium scoreboard based on how good a demo sign looked, the easy-to-use software that comes with the sign, and the reputation of the company, according to Zemanick. The professional-quality digital scoreboard was installed in August 2017 just before the first football game, and the impact of the sign has been better than anticipated. “Students and fans love the board. Athletes feel it creates a professional atmosphere, and the sound and graphics generate a lot of excitement during games,” said Zemanick. Non-athletes also are benefiting from the technology. Students interested in video production and reporting quickly started shooting video around town and packaging warm up videos to run on the board. The school recently purchased a wireless video camera, which will allow students to display live crowd shots, conduct sideline interviews, and generate other real time video. Ultimately, it is the intention of faculty to train students to operate the scoreboard and video display during games. “This kind of experience is terrific for kids applying to college. It gives them a way to showcase their work and set themselves apart from other applicants,” said Zemanick. Perhaps the most impressive benefit is that the school has raised nearly $60,000 in ad revenue in just six months. The school hired an advertising representative to sell banner ads on the board as well as static ads on light boxes surrounding the scoreboard. Soon, parents and fans will be able to easily buy and schedule shout-out banners on the board to support athletes.